I started with this idea of creating a little black dress for Avery unsure of how she would handle a photo session with changing out clothes and accessories. Avery jumped on the idea and declared this black Modkid Hailey her new favorite dress! 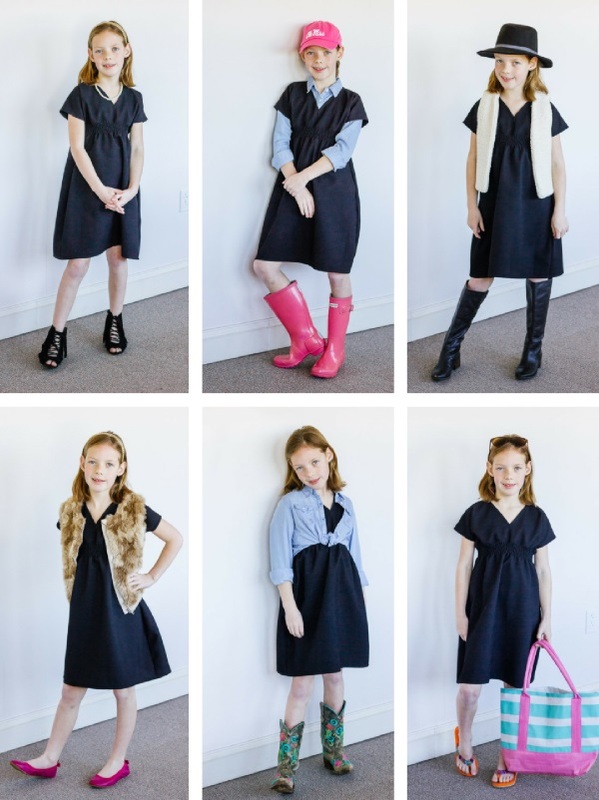 The Modkid Hailey has a great shape with the V-neck and dropped shoulder. The shirring under the bodice gives it even more shaping. I had started putting together a sew-along for this dress, but it turns out black is not the way to go for a tutorial. I did want to show you the cool texture of this vintage woven fabric. I have no idea what it might be. It is almost spongy to the touch, but it doesn't have any stretch and not much drape. I pulled out a few of Avery's favorite ways to style this Hailey for a closer look. Boots, always boots! The denim shirt worked great under or over the dress. Since the Hailey is such a quick sew, it works great as a cover up. I think a gauze version would be excellent for summer. There is something so classic about this look. In fact, I'm tempted to sew up the Hailey Misses for the very same look! The Hailey patterns now come as a bundle if you need some in your life too. This was one of those times that Avery gave me the best hug thanking me for her dress. It doesn't get any better than that! !